Now that I've gotten my fill of pizza and spaghetti (the two things I always end up missing), I've been keeping my eye out for Mexican restaurants that actually serve good Mexican food. Things that remind me of that warm night where my friends and I did shots of smoky mezcal out of earthen bowls while overlooking Santo Domingo de Guzmán. 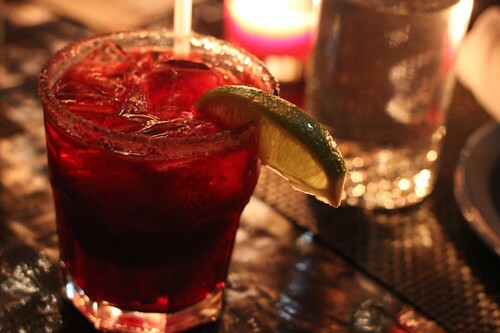 One such winner of a restaurant has been on my radar for forever, yet never got a visit: Mercadito. Eating in Mexico was a funny thing--we ate a lot on the go. Rushed breakfasts in hotel dining rooms, bags of junk food on buses, picking from stalls in markets, missed meals entirely, but we did get a couple of fancier delicious meals in. None of those meals involved flautas, and if it had involved ones like these with a black bean hash, tomatillo salsa, and a healthy serving of crema fresca, the empty plate would have been sent back within minutes for a round of seconds and thirds. 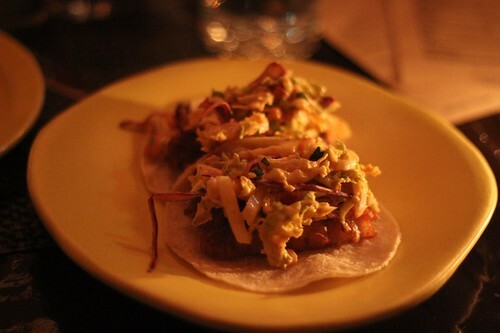 The meal involved a couple of rounds of tacos including these Estilo Baja ones: battered fish tacos with coleslaw and chipotle aioli. They reminded me of other warm times I've been think about fondly in these bitter winds--and using as motivation for running--pre-beach lunches at Rockaway Taco, sheltered from the hot sun, and telling my boos the goings-on of the past week. I also got a round of the Hongos tacos since my dining companion had never tried huitlacoche. It's a fungus that grows on corn, you can get it fresh in Mexico, but only canned in America. 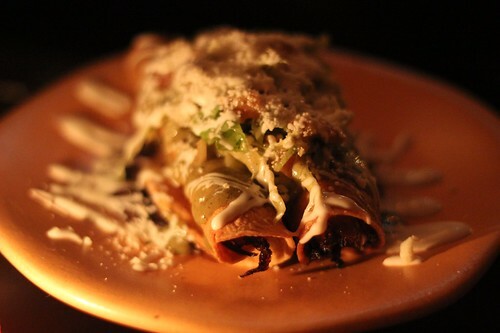 It has a similar taste to mushrooms and is paired with wild mushrooms in the tacos. I've had it out on Roosevelt Ave where they're obviously not as done up as the ones here. 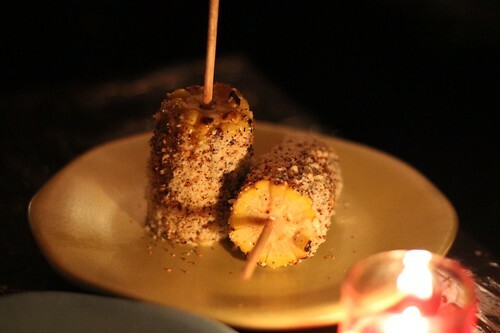 Elotes are the Mexican corn phenomena that everyone knows about and absolutely loves. Except for me. My aversion to corn on the cob runs deep, way deep. Mercadito doesn't bring the elotes to the table with a thick layer of mayo topped with a ridiculous amount of Cotija cheese which I really appreciated, plus the plump and firm corn was slightly roasted--all bonus in my book and I would have eaten more, if I liked corn on the cob. Another even more ubiquitous Mexican delicacy that they do wonderfully was the guacamole. We tried all three, and all were splendid, but the toreado was my clear favorite. I like the spice from the sautéed chile serrano added in, it was the perfect touch to make the guacamole stand out, but wasn't so hot I couldn't keep eating it. 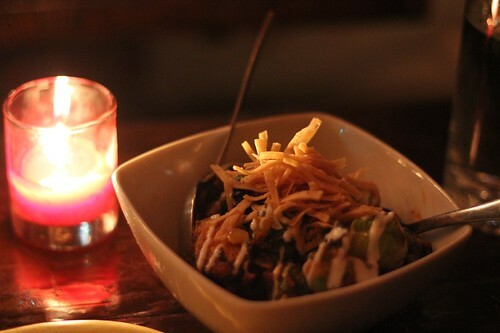 Another favorite was the Coles de Bruselas--Brussels sprouts with chorizo, roasted tomato salsa, and crema fresca. Why had I never roasted my sprouts with chorizo?! I might have to make this for Thanksgiving this year. By the time dessert came around, my pants were asking me to stop the nonsense. But I had to have the Torrejas de Bolillo. The bottom piece is a slab of Mexican bread that's been soaked with creme anglaise and then (I believe) torched to give it a creme brulee like crunchy shell. 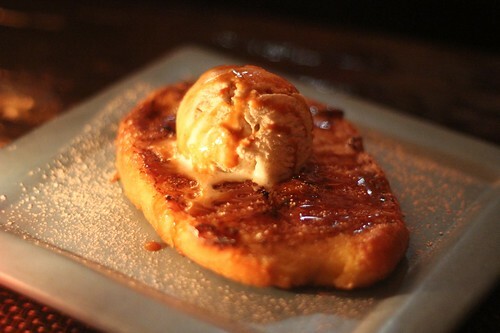 On top of that is cajeta (goat's milk caramel) sauce and plain vanilla ice cream. It was pure delight and entirely refreshing for me to have a dessert that hasn't been done 5,000 times over. By the way, I hear the Mercadito Avenue B is now open for lunch and I spy a torta that needs to be tried on their menu. *Full disclosure* I was invited to come eat at Mercadito right after returning from Mexico. I only accepted this meal because A) I did want to try out their food after missing numerous friends' dinners there over the past years and B) I'm a broke grad student. Don't judge unless you want to contribute to my tuition. Yes, this dinner was gratis, but it doesn't affect my opinion and I'd happily get a meal there again.